Each small black dot represents a single African Buffalo sighting. 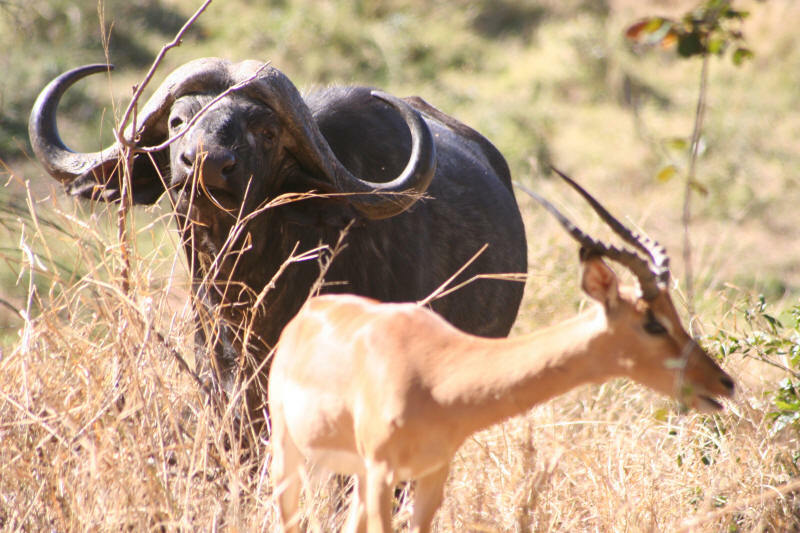 It does not take into account how many African Buffalos were seen a that point in time only that a sighting was made. There a few sites more impressive than to see the wild animals charging across the veld (an Afrikaans word commonly used for savannah or plains) or through what appears to be impenetrable bush thickets. In my last 2 visits to the Kruger I have seen more Buffalo than ever before. I have seen at least 6 large herds and numerous individual or small groups of Buffalo. The coloured dots are explained below and represent locations of the Kruger Park where visitors can stay and/or camp on specially arranged Game Trails. Refer to the table below to see more detail on the actual numbers sighted (African Buffalo normally move in herds). 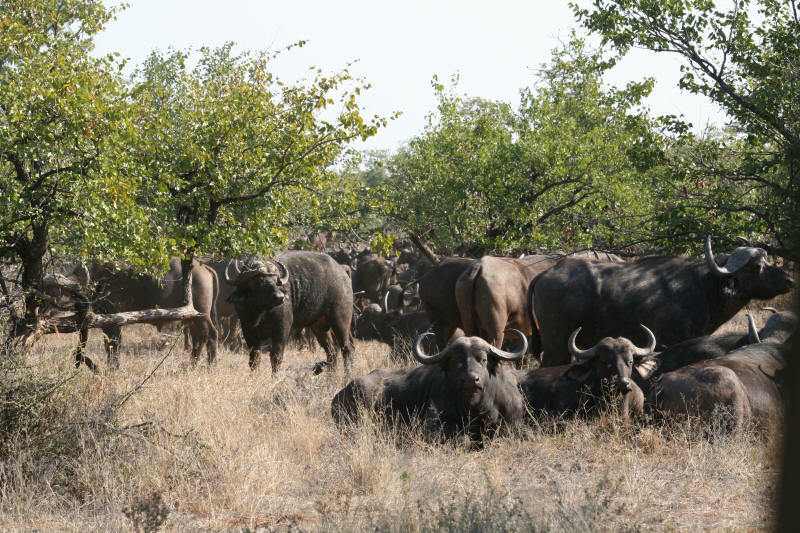 Where there are dense clusters of African Buffalo sighting dots then this suggests this region would be a prime area for spotting the African Buffalo. The Pretoriuskop area in the south west of the park, for example, stands out as prime Rhino territory along with the far north west. 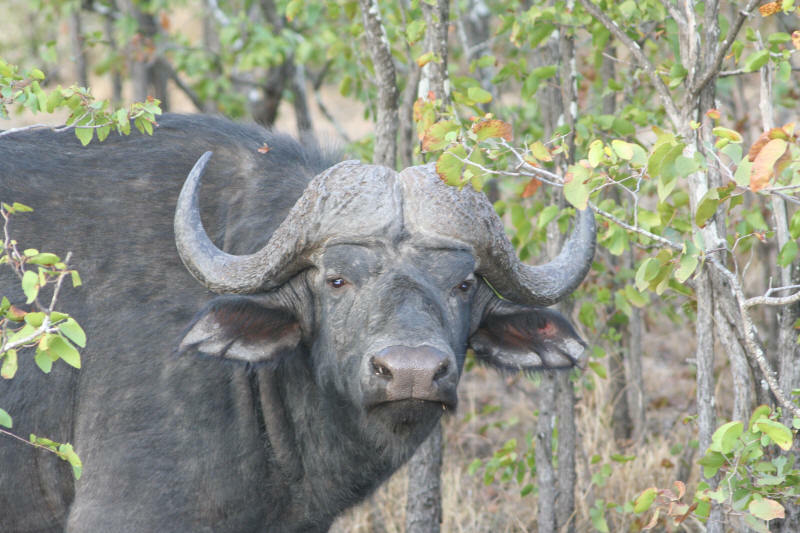 The buffalo can be seen over most of the Kruger as the map plainly indicates. Take note of the occasional sighting in Mozambique ... the Transfrontier Park has allowed some animals to migrate. Basis: March 2005 to Feb 2006 Kruger Park Ranger observations of Buffalo in all KNP sections using GPS incorporated into hand help PDA systems based upon Cybertracker technology. Source of data: Kruger National Park monthly GIS data published in pdf format on their website. Map created by Tony Roocroft using this data source after extraction and reformatting. In addition to plotting the extensive data on the map shown I also analysed month by month sighting numbers and have shown these Buffalo numbers in the table below ... for all other members of the "Big 5" click the link. Take Note: these numbers do not reflect numbers in the total numbers in the Kruger National park (KNP). They only show the number seen and counted by rangers. It is almost certain for example that the same animal was seen on more than 1 occasion. Use the information to get a feel for the relative numbers of the Big 5. On another page I have commented on the actual census figures for the Kruger. The Kruger is split up into 22 sections and the data is the sum of all observations in all sections.